The Edwards Symposium series is a series of annual conferences on soft matter research areas, run as a collaboration between the Turing Gateway to Mathematics, Unilever and the Edwards Centre for Soft Matter. This year’s symposium focused on microscale fluid dynamics, jamming and flow, soft interfaces and responsive and programmable soft matter. One hundred delegates attended the symposium representing both academia and industry. 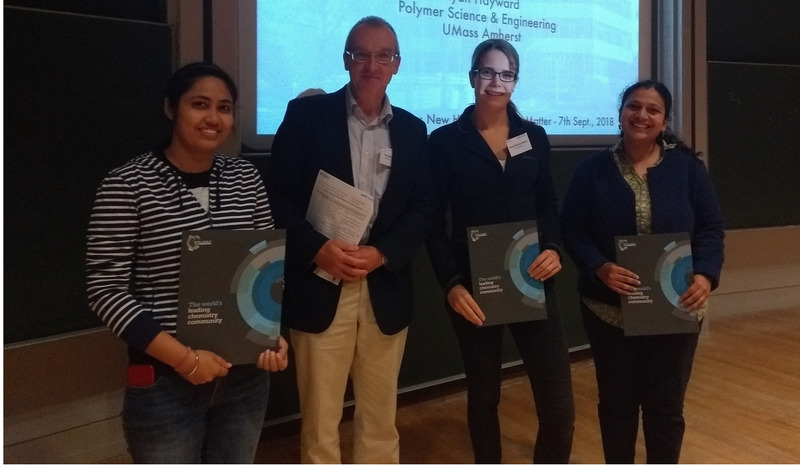 Soft Matter was proud to sponsor three poster prizes, presented by Professor Tom McLeish (University of York). All winners will receive a subscription to the journal and affiliate membership to the Royal Society of Chemistry for one year. 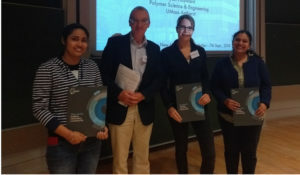 Deepika Srivastva (Johannes Gutenberg University Mainz) won for her poster presentation titled Flow Behaviour of Chain and Star Polymers and their Mixtures.